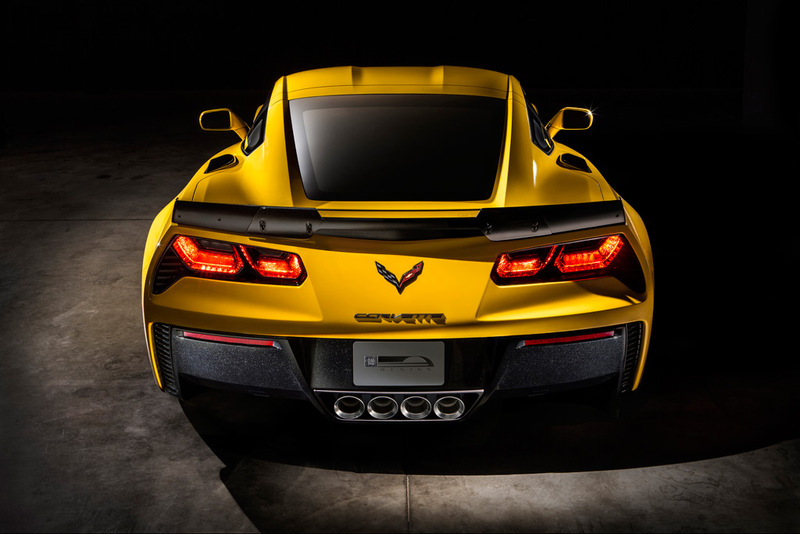 Distinguishing the Z06 rear view is smoked taillights; standard 2015 Corvette taillights are red. The LEDs illuminate red so the appearance is the same when they are on. 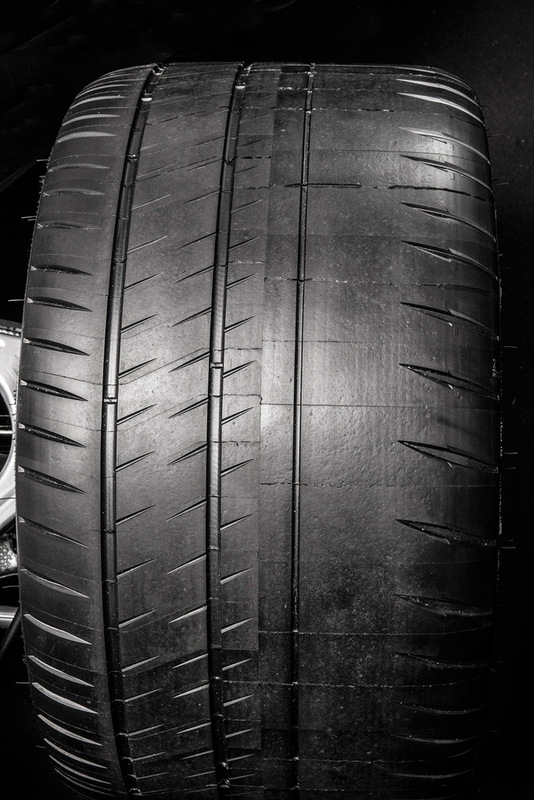 Left: The Michelin Pilot Sport Cup 2 tires on the 2015 Corvette Z06 with the Z07 performance package are P285/30ZR19 front (compared to P245/35R19 for the standard issue Z51), and P335/25ZR20 rear (compared to P285/30R20 for the standard issue Z51). 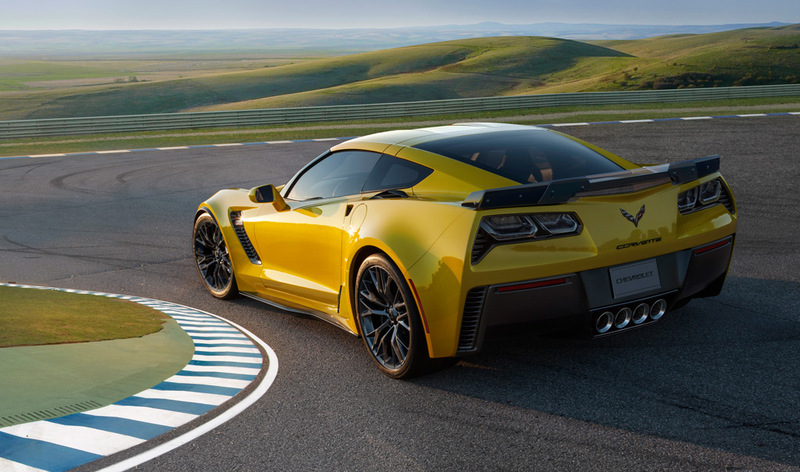 Right: Z06 wheels are 19 inches x 10 inches in the front (the Stingray Z51 comes with 19 inches x 8.5 inches) with the rears measuring 20 inches x 12 inches (compared to 20 inches x 10 inches on the Z51). 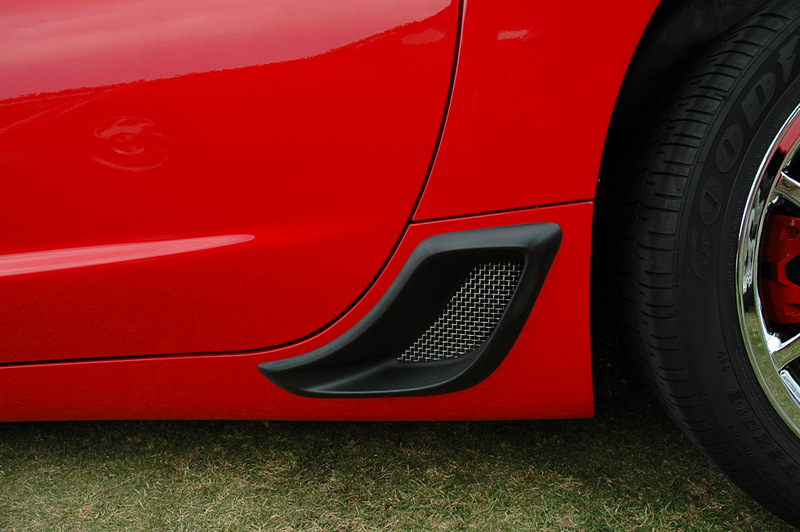 The standard Z06 features a front splitter, spats around the front wheel openings, a unique carbon-fiber hood with a larger vent, and a rear spoiler that is exclusive to the Z06. 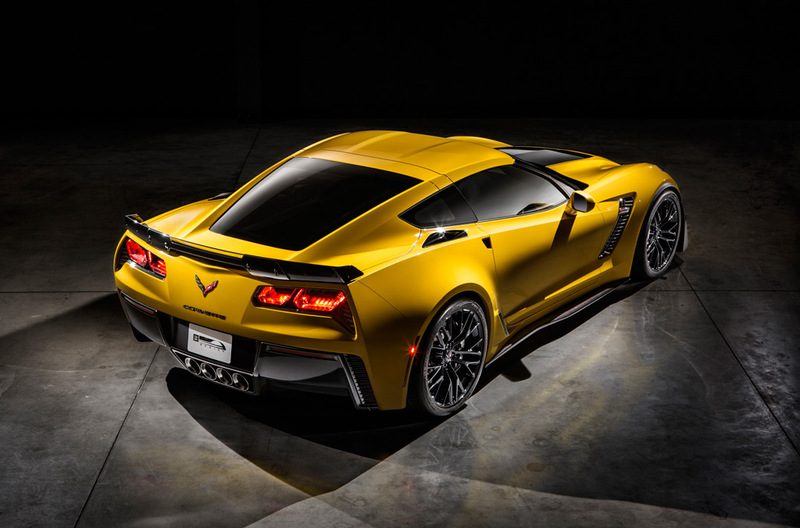 An early GM press release indicated the Z06 would use the rear spoiler from the Corvette Stingray’s Z51 Performance Package. 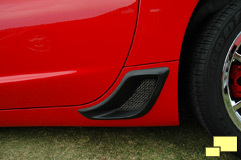 An available Carbon Fiber Ground Effects Package ($2,995) - in either black or a visible carbon-fiber finish ($2,995) - adds a carbon fiber front splitter with aviation-style winglets, carbon fiber rocker panels, and a larger rear spoiler with a fixed wickerbill – a small, vertical tab at the edge of the spoiler that significantly increases downforce. 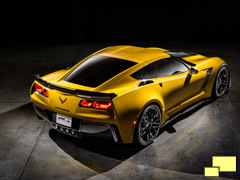 Below: The available Z07 package ($7,995) adds larger winglets to the front splitter. 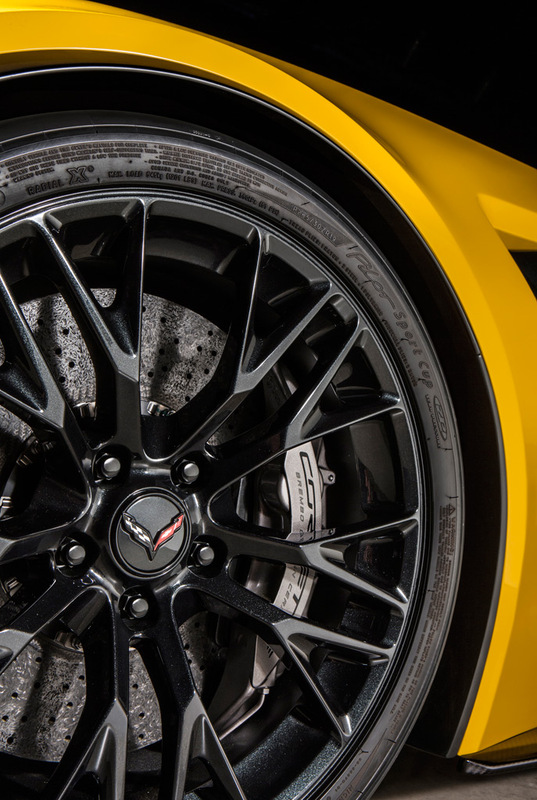 Brembo carbon ceramic-matrix brake rotors that improve braking performance and contribute to better handling through reduced unsprung weight are included with the Z07. 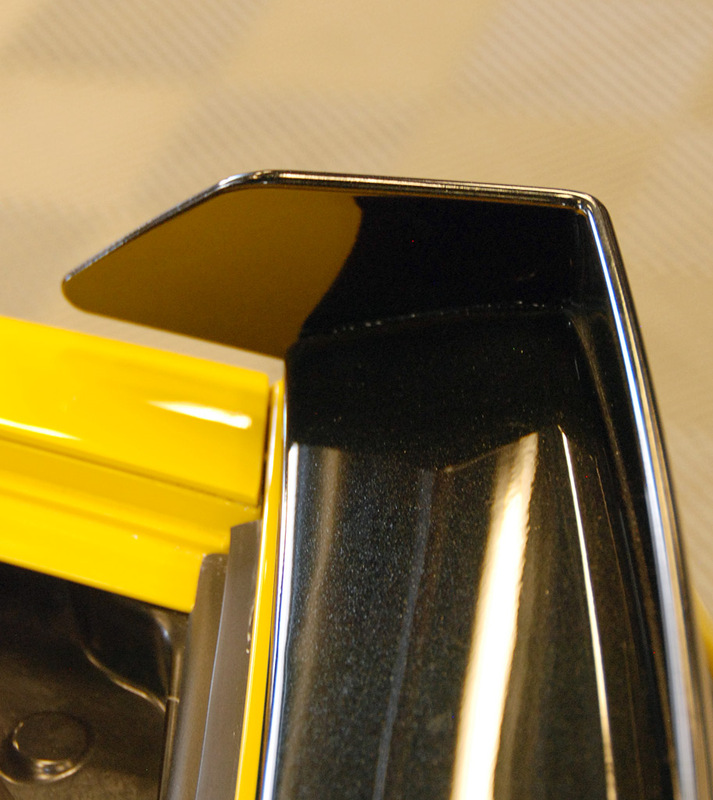 Right: The Z07 Performance Package includes a significant spoiler upgrade which features wickerbills (vertical plates) at each end that adds significant downforce. Below: The see-through center section is adjustable to allow at least the promise of better lap times. 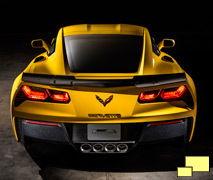 Above: The C7 Z06 is equipped with enhanced rear brake cooling in the form of a lower air intake. Fully functional, they are also reminiscent of the 2001 Corvette Z06 rear brake intake (right).